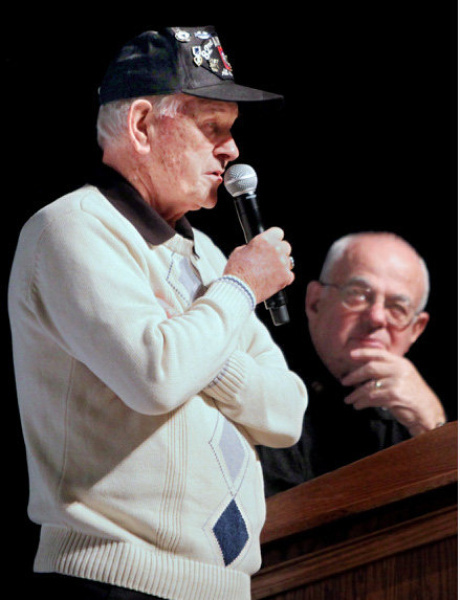 An American veteran of World War II and a German Jew whom he helped to rescue in Nazi-occupied Holland shared the stage at Granville Middle School (also in New Albany & Johnstown) yesterday to talk about their experiences and to preach the importance of tolerance. The presentation also gave students a chance to hear stories firsthand— an opportunity that is quickly fading away. persecution in Germany, only to be forced into hiding to avoid being sent to a concentration camp after the occupation, told of the Jakobs family’s ordeal and its liberation by American soldiers from Jakeway’s regiment in 1944. Now living in Palm Desert, Calif., Jakobs said he would rather live in the present than the past, but as he got older, he realized the importance of sharing his story. That’s why he agreed to come to central Ohio after he was contacted a few weeks ago by Mark Easton, a New Albany resident who had met Jakeway through volunteer work with veterans. schools, wrapping up with Granville yesterday before Jakobs flew home in the afternoon. Jakeway, a Johnstown resident, knew of Jakobs because he had corresponded with Jakobs’ sister, Edith Jakobs, who was living in Israel. Jakeway was working on a book about his experiences as a paratrooper in the 508th Parachute Infantry Regiment of the 82nd Airborne Division during the war. The two wrote regularly from 1986 until she died last year, he said. Meeting her brother at Port Columbus on Wednesday was an emotional moment, Jakeway said. Listening to Jakobs speak to school groups taught him a side of the war that he had not experienced as a soldier. “I never got a chance to meet this family,” Jakeway told students yesterday. “I never remembered the homes, the houses, because we were looking for people behind them, or in the trees or bushes. There was a lot of fighting going on.” He echoed Jakobs’ call for students to be tolerant of those unlike themselves, reminding them that the Jakobs family had never harmed the Nazis who persecuted them.